Only two autocratic presidents have ruled Gabon since independence from France in 1960. The current president of Gabon, El Hadj Omar BONGO Ondimba - one of the longest-serving heads of state in the world - has dominated the country's political scene for almost four decades. President BONGO introduced a nominal multiparty system and a new constitution in the early 1990s. However, allegations of electoral fraud during local elections in 2002-03 and the presidential elections in 2005 have exposed the weaknesses of formal political structures in Gabon. Gabon's political opposition remains weak, divided, and financially dependent on the current regime. Despite political conditions, a small population, abundant natural resources, and considerable foreign support have helped make Gabon one of the more prosperous and stable African countries. 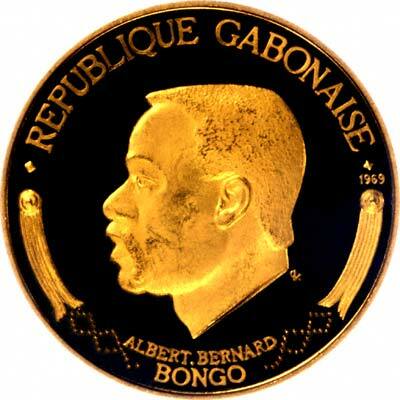 As Gabon only became independent in 1960, this was the first occasion when it was able to issue gold coins in its own right. President Mba guaranteed he would be immortalised by issuing an gold independence proof coin set in 1960. We have yet to acquire one of these. The next issue of gold coins was in 1969 under the wonderfully named President Bongo, who we think should have come from Congo. 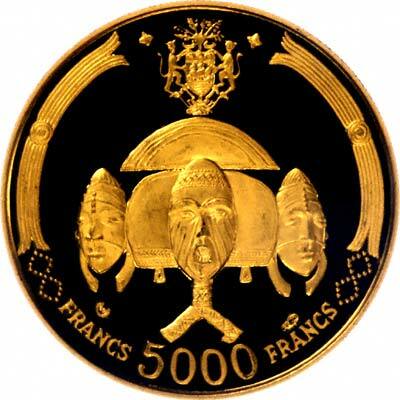 The reverse shows a three masks, apparently a reliquary figure of Bakota. For silver and base metal coins of Gabon, please look at our original Chard Coins website.